Caffeine is a tool used to temporarily prevent the activation of the screensaver / lock screen / sleep mode when using full-screen windows. The application is useful when using video players that don't do this automatically, when listening to music while not using the computer, etc. With the 2.7.x release, Caffeine stopped using an Ubuntu AppIndicator, a feature that many considered essential, resulting in various forks being developed. and Caffeine won't allow the desktop to become idle for the duration of "COMMAND". 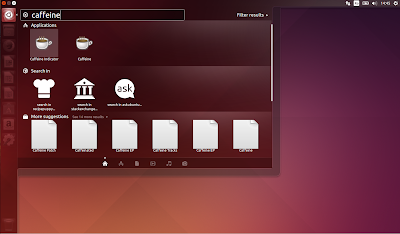 Ubuntu 14.10 and 15.04: you can grab the Caffeine 2.8 deb from HERE. Note: make sure that libappindicator3-1 and gir1.2-appindicator3-0.1 are installed ("sudo apt-get install libappindicator3-1 gir1.2-appindicator3-0.1") because the package is currently missing these dependencies and the Caffeine indicator will fail to start without them (I reported the bug HERE). 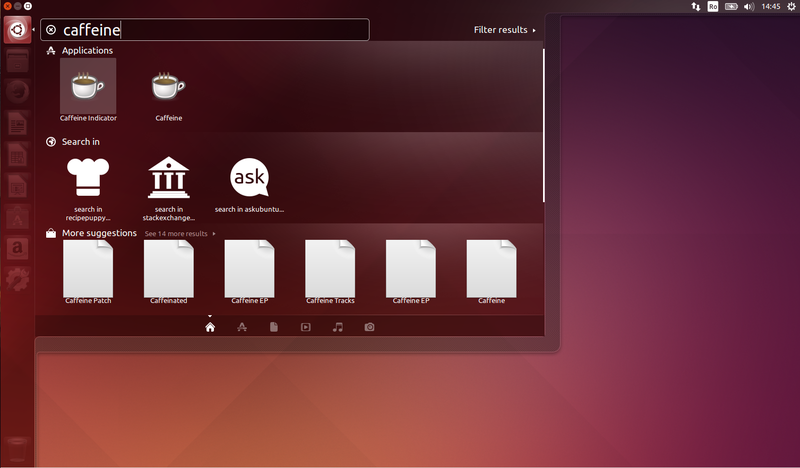 Ubuntu 12.04: Unfortunately, Caffeine 2.8 doesn't work in Ubuntu 12.04. However, you can use the PPA above to install an older version (2.4.1). If you're not using Ubuntu / Linux Mint and derivatives, you can download the Caffeine source code via Launchpad (BZR). Important note: Caffeine is set to start automatically on login, but only the command line version so if you want to start the indicator on login, you'll have to add "caffeine-indicator" to your startup applications.